Maybe they've stayed together so long because of a few acetyl groups near a couple of key genes. Image courtesy of Wikimedia Commons. Love at first sight is a magical, mysterious thing. Unless you are prairie vole that is. Then, if the results of a new study hold up, it is just a few chemical groups scattered around a couple of different genes. Now calling this love may be stretching things as these are rodents and not people. Still, prairie voles are one of the few mammals that mates for life (click here for a list of some other animals that do the same thing). And what we have learned about the genetics behind their monogamy has turned out to possibly explain some men’s cheating ways. It will be interesting to see if what they’ve learned about prairie vole partner selection can translate to people too. Undoubtedly love is more complex in people although maybe turning up these genes at the right time is a key component in becoming smitten. Love in a prairie vole starts with finding a partner they like. The two then mate and the deal is sealed...they are monogamous partners. This process is called partner preference. Cozying up to and then mating with a partner causes two genes, the oxytocin receptor (oxtr) and vasopressin V1a receptor (avpr1a) genes, to get more active in the brain of a prairie vole. When the researchers looked closely, they found that this was because acetyl groups had been slapped onto nearby histones. Love in a prairie vole may be as simple as loosening a couple of these histones. Image courtesy of Wikimedia Commons. The DNA of plants and animals (and lots of other beasts) is packaged around little protein spools called histones. Besides letting cells like ours cram six feet of DNA into their tiny nuclei, this packaging also helps to control which genes are on and to what levels. One way a gene is controlled is if the packaging pushes it down into the middle of the DNA heap. Now the cell can’t even see that piece of DNA. 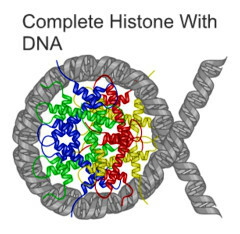 Another way is if a histone grabs onto the start of a gene and holds it tightly. The cell has trouble prying the histone away, meaning the gene it is covering will then be turned on very little -- if at all. When a cell needs to make a gene more active, it sometimes controls how tightly a histone holds onto DNA by adding or removing acetyl groups. The more acetyl groups on a histone, the more negative charge it has. Since DNA is negatively charged too, the two repel each other, so the histone doesn’t hang on so tightly. And it looks like this is what happens around the oxtr and avpr1a genes in prairie voles once they choose a partner. One of the cooler experiments the researchers did was to get prairie voles to commit without mating by directly tweaking the histones in their brains. They took female prairie voles and put them in a cage with some hunky males. They then injected the females’ brains directly with chemicals that prevent the cell from removing acetyl groups from histones (HDAC inhibitors). This buildup of acetyl groups is the same as adding new ones. What they found was that the injected females chose their partner without mating first. The chemical mimicked the effect of mating (although presumably in a less pleasurable way!). This little guy can teach us a lot about monogamy. Image courtesy of Wikimedia Commons. When the researchers compared the brains of these females with those that had chosen a partner the more traditional way, they found that both had histones with extra acetyl groups around the oxtr and avpr1a genes. Incredibly, even though these chemicals are not specific to these genes, only these genes seemed to be affected. This is strong evidence that turning these genes up is enough to at least get the whole process rolling. If we think about it for a bit, this sort of finding shouldn’t surprise us too much. Something as intense as partner selection is bound to have profound effects in the brain and it was most likely to happen in some sort of epigenetic way. 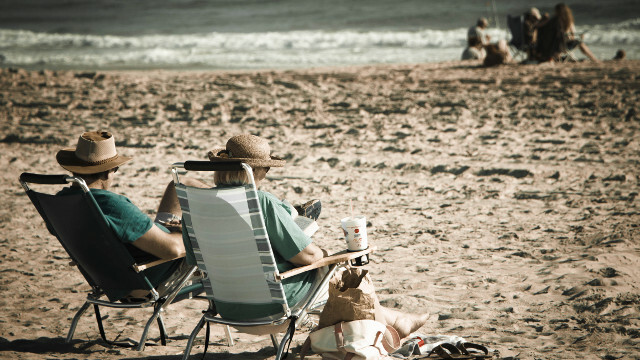 Epigenetics is that hot topic that helps to explain how the environment can affect our genes in a long term way without permanently affecting the underlying instructions spelled out in those A’s, T’s, G’s and C’s you’ve heard about. Importantly, these sorts of changes can also be erased before they are passed on to the next generation. No need to worry about a bunch of oedipal prairie voles running around! So partner selection (or, dare I say it, love) changes the brain in profound ways that we are beginning to figure out. Does learning the detailed biochemistry of love take anything away from it? I don’t think so. Something still has to come along to prompt the changes in the brain that alter it so the person falls in love. I guess the only concern might be if once we have as good a handle on human love as we do on prairie vole partner selection, we may be able to find ways to mimic the effect without that environmental prompt. A 21st century love potion like this would be most worrisome.